Pulau Ketam is an island mostly inhabited by the Chinese from the clans of Teochew and Hokkien. These days, most of the population that stay here are the elderly people and younger children. Most of the children leave home after completing their secondary education to pursue their studies at the mainland or overseas. Most do not return to settle down due to lack of suitable jobs and infrastructure. Though not as attractive as the other islands of Malaysia, this island is still a popular destination for family outings especially during the weekends and public holidays. Most local tourists come here to expose their children to the lifestyle of the villagers here besides getting them to experience the journey by ferry that navigates through the thriving mangrove swamps. The air-conditioned ferry to the island. The non air-conditioned ferry that operates only during weekends and public holidays. 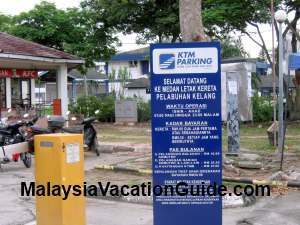 You can park at the KTM Komuter Station parking lots located just before the jetty to Pulau Ketam. If you have not been here and would like to go for an outing, you may want to consider visiting this island. Allocate about half a day including taking the ferry to and fro the island. As the weather can be hot and humid, make sure you get a cap, a bottle of water, sun screen and sun glasses to make your trip more enjoyable. 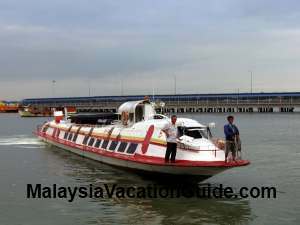 You will need to go to the jetty at Port Klang to take the ferry to the island. The best way to go there is to take the KTM Komuter train and alight at Port Klang Station. From here, take a 5 minutes walk to the Jetty to Pulau Ketam and purchase the ferry ticket. If you prefer to drive, there are plenty of parking bays available near the jetty. Use KESAS Highway or the Federal Highway to come here. You can park at ASA Seaview Restaurant or Pulau Ketam Jetty Parking. The rate is about RM3 per day. The other parking bay within the vicinity is at the KTM Komuter Station. The rate is RM0.50 per hour. The GPS coordinates of KTM Komuter Parking is N02° 59.974' E101° 23.504'. The ferry tickets can be purchased at a table set up as you walk towards the jetty. The one-way price is RM7 per adult and RM5 per child. Two-way tickets are priced at RM14/child and RM10/child. The typical ferries used are air-conditioned type. During public holidays or weekends, there are other non-air conditioned ferry operators that will try to get you to buy their tickets that are usually priced at RM15/adult two-way. This ferry are slower and not punctual compared to the air-conditioned type but you will be able to see the scenery and feel the breeze of the sea. Hence, it is a good idea to find out the type of ferry before you purchase the tickets. Go for the air-conditioned type if you want punctuality and faster arrival time. The main village is Kampung Pulau Ketam. The other smaller village is Kampung Sungai Lima. Sometimes, the ferry will stop at the smaller village before going to the main village. Make sure you get down at the correct jetty. The main mode of transportation on the island is by bicycle other than walking. There are no cars here and getting from one village to the other is by boat or ferry. Rent a bicycle for RM5 per day and explore the village at your own pace. If you go during the public holidays, the narrow walkway can be crowded and you will have to navigate your way through the crowds. You will probably spend about half an hour to one hour looking at the way of life of the villagers. You may notice the villagers manually peeling the prawns to be made into prawn paste, women repairing the damaged fishing nets and workshop that repairs motors and other equipments. The walkway to the village is built using wooden planks. The harvesting of rain for normal washing. 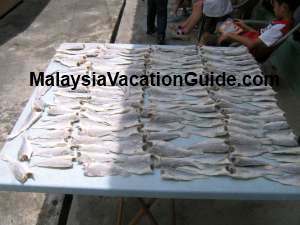 The salted fish being dried. During sunny days, salted fish are being dried by the villages along the walkway. You will also notice that there is a police station, a big temple, a church and a mosque, all within walking distance of each other. Take note also of the simple rain harvesting method used here. It is basically a pipe that is connected to the roof of the house with the other end being placed at the big container. Satellite receivers are a common sight here too. In recent years, many of the people in this fishermen village has turned into tourism to make a living. 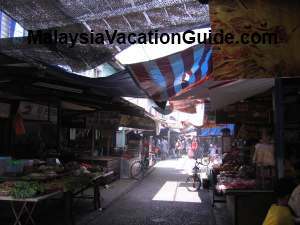 You will see many shops selling all kinds of sea food products such as dried prawns, anchovies, salted fish and prawn paste to visitors who come here. 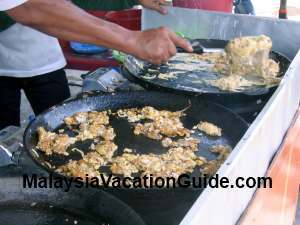 During peak season, you will see many stalls selling oyster fried with eggs or clams("La La" in hokkien) fried with eggs outside the seafood restaurants. A serving for 4 persons costs around RM10. Quench your thirst by taking a glass of fresh sugar cane as you walk towards the direction of the temple. A glass cost less than RM2. You may want to add more ice if it is too sweet. 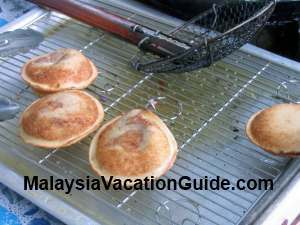 Try also the fried ice cream at the mobile shop near the Pulau Ketam Inn. The flavour you can choose include yam, strawberry, vanilla or chocolate. These ice cream are pre-wrapped before being fried when you purchase them. Try the fried egg with oyster or clams. 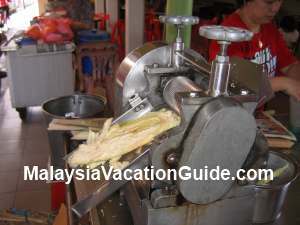 The sugar cane juice is extracted using this machine. Fried ice cream is a product that is unique here. Take your lunch or dinner at the many shops around here. Clams, prawns, crabs, fish and oysters are some of the seafood dishes that you may want to try. The price is almost similar to if you were to take them at the mainland. 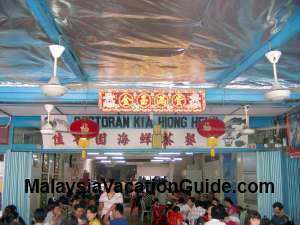 Restoran Sea Food Kia Hiong Haun and Restoran Kuai Lok Hian are among the many restaurants that you can try. 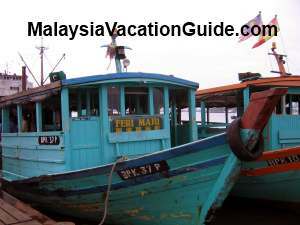 You can also arrange for a tour to the Kelong where the fishes are being farmed for commercial purposes. You can see these kelongs from the ferry as you are about to reach the main village. Fishing can also be arranged by the tour agency that is located at the island. One tour agency located near the jetty is known as Green Way Tour Service. One of the many restaurants that will be packed during public holidays. The shops that you can visit to purchase seafood products. 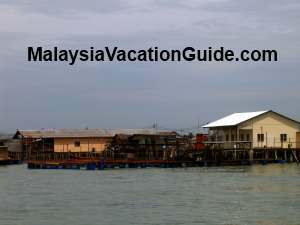 The kelong that is used for fish farming that you will encounter as the ferry is about to reach the jetty. If you would like to stay here and experience the village living, there are two hotels that you could opt to stay. 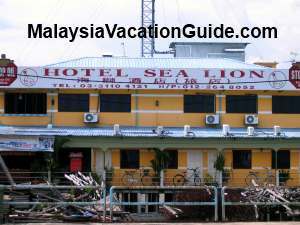 The biggest hotel here is called Sea Lion Hotel located near the Pulau Ketam Jetty. The room rate for a deluxe air conditioner room starts from RM68 per night. This hotel also provides tour packages such as going to the fishing farm, sea fishing trip, seafood and return boat transfer as well. 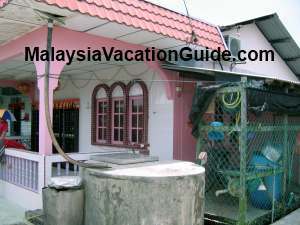 The other hotel is Pulau Ketam Inn also located within walking distance of the jetty. A standard air conditioner room starts from RM60 per night. This hotel also provide other services such as speed boat, fishing trip and rental of bicycle. The Sea Lion Hotel is located just beside the jetty.